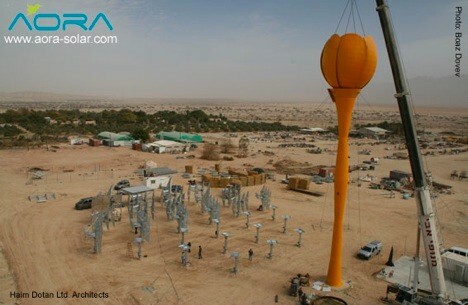 A company called AORA has developed a hybrid solar power plant in the Israeli desert. Comprised of a number of 100kWe base units, the operation is modular (additional units can be added) and it should be complete sometime in the next ten days. 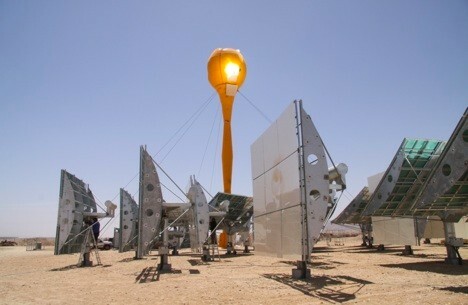 When operational, thirty mirrors will track the sun and direct its rays up to the 98.4 foot tall "flower," where the concentrated sunlight heats compressed air, which in turn drives an electric turbine. When the sun has set for the day (or if it's cloudy) the turbine can be run off of biodiesel, natural gas, or fossil fuels, allowing the plant to operate twenty-four hours. The only downside we can see is that the huge tower is sure to attract psychopaths like Lord Humungus and Wez -- so you'll want some weapons. More pics after the break.